Poetry as therapy usually produces dull work. It’s function is to aid a person in their recovery or to help them through a difficulty. Insofar as it helps the person writing it, it has value. For the reader though, it can be turgid. Aaron Kent’s Tertiary Colours is anything but. Subtitled A Post-Traumatic Verse, Kent’s pamphlet from independent UK publisher Knives, Forks and Spoons manages to avoid the worst aspects of poetry-as-therapy. Instead, in this short work – it runs to just 33 pages – we are invited into a densely packed, frightening world where trauma haunts the everyday and paralyses the narrator of the poems. It is emotionally exhausting to read – impactful, unflinching, it is poetry not for the faint of heart. There are lines with strikethroughs, suggesting erasure and reconsideration. Yet they remain readable. Excised but present. Such devices act as means for Kent to not just say what he wants to say, but also to indicate a not always clear grip upon “reality”. 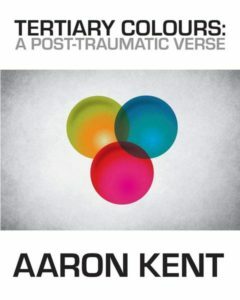 A formally adventurous series of poems, Tertiary Colours is a serious exploration of the lasting impact of trauma – in this case the trauma of having been the victim of sexual abuse. You may not feel better after reading it, but it is not a pamphlet of poetry you are likely to forget in a hurry. David Toms lives and works in Norway. His poetry has been widely published in Ireland and internationally, and his newest chapbook, written with Maren Nygard, dikt / actions osl / ondon is available now from Smithereens Press.